September | 2018 | Quilting my way through life! & 2 very simple 9-Patch blocks. It was so simple that I didn’t even take any pics of fabric choices. so you’ll be able to do this week’s work with 1 hand tied behind your back. Lol! Perhaps you can use some of your extra time this week getting caught up with some of your other quilting projects. Chloe and I will be vendors at this week’s show. Come join the fun! See hundreds of fabulous quilts and special exhibits! Shop our vendor mall, guild boutique, and silent auction! 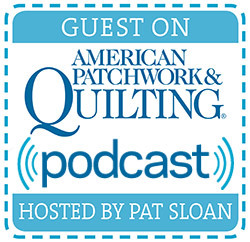 Attend inspiring, free lectures and antique quilt bed turnings! Document your treasured quilt with a quilt appraisal! Need a short break? Visit our on-site concession areas! Hourly door prizes too! Click here for more info if you need it. that are being sewn & shown! Thanks for participating in my very first Quilt-Along! I absolutely love my quilt!!! Tamara’s quilting is stunning as always! but it sure is fun watching your quilts grow a block or 2 at a time. & I decided to draw from my Michigan souvenir! I know where you live & work Karen so I can deliver! Just let me know if the BOO pattern is OK or if you’d rather have a different $10 pattern. There are many to choose from on my website. Thanks again to all of you Dresden Quilt Workshop Sampler quilters! You still have 24 hours to finish up all the sewing and be included. so we can all be impressed with your sewing abilities! these supplies for your little Dresden sewing basket. I had the privilege of being invited to teach in Michigan last weekend. One might think that Tim The Toolman (Tim Allen) had a part in that because I hear the “Pure Michigan” commercials ALL THE TIME these days, but no! The Berrien Towne & Country Quilters invited me. What a wonderful group of quilters! They requested my Quilt-as-you-go, Little Frosties for Friday’s workshop. By end of class most everyone had all of the piecing done. Some even had the applique ready to stitch! This was the view across the street from my hotel! I’d say they’re just as beautiful if not more so than at Rick’s Cafe overlooking the ocean in Negril, Jamaica. On Saturday we made Tiny & Mini Dresden plates for my Dresden Heaven pattern. Everyone worked hard making their little Dresden plates precise. This was a very dedicated group! By end of class everyone had at least 2 perfect plates & they were still smiling! By end of day there was another spectacular sunset! I want to be able to share more with my next class in a couple of weeks. It’s quick & easy to cut these with the 1″ & 2″ circle cutters (on my website). then snap out 6 perfectly round templates. I love the perfection of the process! A perfect place to store some Tiny Dresden plates! Shedd’s peanut butter used to be made in Michigan until the 1980’s apparently. I love exploring and learning about an area where I’ve never been before. During a ride to an antique store in the country I also experienced the scent of grapes in the air. A quilter had asked me if I smelled any & was happy that I had noticed, Lol! Thanks, Peri, & the rest of The Berrien Towne & Country Quilters. A fun & memorable trip. Now, are those quilts finished yet??? A Give-Away For Our Dresden Quilt Workshop Quilters! Anybody want to win some quilting loot? be a member of my Dresden Quilt Workshop” Facebook Group. Just show us your Dresden Quilt Workshop Sampler pieces Week #1-Week #6 completed. If you’ve not already become a member of Dresden Quilt Workshop click & go now. you’ll just need to comment on the post I’ll be drafting over there. What’s the loot, you ask? & A Dip & Dab Roxanne Glue-Baste-It. If you already have one of my Boo patterns, another pattern will be substituted. The drawing will not be until Sunday at 6 p.m. (CST). Yes, it’s going to interrupt my Sunday football, Lol! We will be making 2 Widgets blocks. The cutting instructions will be for 4 blocks, but you only need to make 2. That’ll be enough decisions for 1 week, huh??? Apliquick Bars & Roxanne Glue Baste It can help you immensely! Just look at those seemingly perfect 2″ circles!!! These actually come together really quickly! or maybe it just beat me down, because I didn’t take any pics of those decisions. I hope you’re enjoying the process as much as I did. Don’t forget to post your pics. We all want to see your progress!